What are Marriage Licence Bonds and Allegations? Records created when a couple chose to be married by licence, rather than by the calling of banns. Almost all marriages before 1837 were carried out within Church of England parish churches, and most of these were solemnised after the calling of banns within the church (repeated announcements within their parish churches of the couple's intention to marry, during the weeks preceding the actual marriage). However, couples could choose to marry after obtaining a licence from the bishop (usually issued by a senior clergyman acting as the bishop's surrogate), either as a status symbol (because it required payment of the licence fee), or to avoid the delay caused by repeated calling of banns. Before a marriage licence could be granted, an affidavit (called the allegation) had to be sworn (usually by the groom), and until 1823 a bond was also required. These are the main records included within this series. 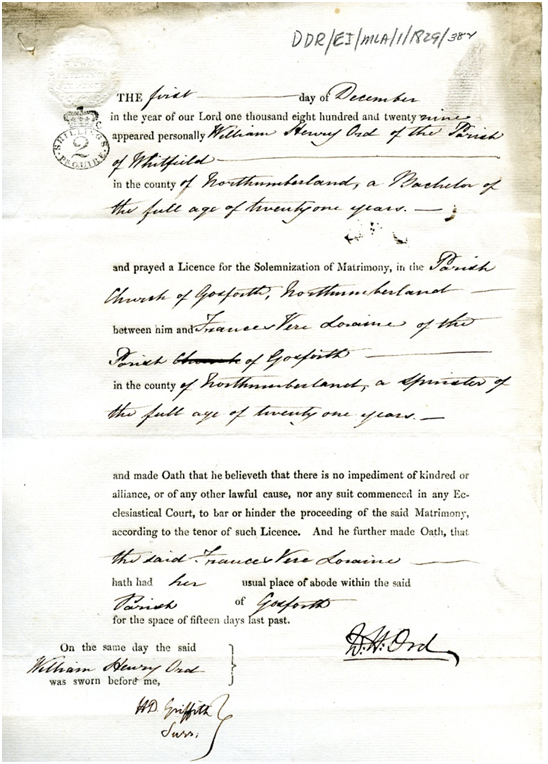 The Marriage Licence Bonds and Allegations relate to the whole diocese of Durham (County Durham and Northumberland until 1882, County Durham only thereafter), see bottom of page for details. They date chiefly from 1664 (with some surviving from 1592) until 1995. What family history information will I find within the Marriage Licence records? For those aged 21 or over, the marriage licence allegation (sworn statement or affidavit) merely states the information about the bride and groom that should be recorded within the parish register or Bishop's Transcripts (BTs) marriage entry after 1812. For earlier marriages, the parishes of both parties are included within the allegation, but may not be recorded within the register/BTs. The allegations are mainly useful for those who are under 21, in which case parental consent is required and names of parents will be recorded on the allegation. For the family historian, the groom's signature may also be of interest. Bonds (committing the signatories to pay a penalty if the allegation proves to be false) record slightly less information about the marriage itself, though they name an additional surety who took part in the bond, and who may be a close family member or acquaintance. Note that the date of the marriage licence allegation is not the date of the marriage (it is usually a few days or week(s) before the actual marriage), and is not evidence that the marriage actually took place. Most marriage licence allegations add little if any information to the record of the marriage within a parish register (or Bishop's Transcript), though the parish of abode for both bride and groom should be stated. For those under 21, parental consent is also required, so both parents' names will be included. For 1594-1815, printed calendars list the marriage licences granted within a specific span of years, with details of both parties, the surety for the bond and (where stated) parents giving consent. Each calendar is separately indexed by both name and place. Digital images of these calendars are available on the familysearch website. For each calendar (span of years), the calendar is divided into four sections: a page of abbreviations, indexes of names and places, and the list of marriage licence records (called 'marriage abstracts'). See note below about access to these images on familysearch. For 1816-1820, there is no printed or online catalogue. A card index is kept within the search room at Palace Green Library, enabling you to locate the entry for any specific bride or groom. For 1821-1837, the online catalogue of records includes full details from the marriage licence bonds and allegations, and can be most easily browsed online. If preferred, annual lists with indexes (similar to the printed calendars) can be downloaded as PDF files, for 1821, 1822, 1823, 1824, 1825, 1826, 1827, 1828, 1829, 1830, 1831, 1832, 1833, 1834, 1835, 1836, 1837. After 1837, there are no catalogues. Information about marriages can be most easily obtained from civil registration records rather than from church records of marriage licences. Are the Marriage Licence records available online? Yes, digital images of almost all the records for the period before 1900 are available at the familysearch website. Within the final column of the table below, Durham refers to marriage licence bonds and allegations within the Durham Diocesan Records, Borthwick refers to records in the Borthwick Institute for Archives at the University of York, Woodhorn to Northumberland Archives at Woodhorn. Background information on marriage licence applications within Durham is within our Administrative Histories guide to the Durham Diocesan Records. See also guide to marriage bonds and allegations from the Borthwick Institute for Archives, for general examples and guidance on marriage licence bonds and allegations.